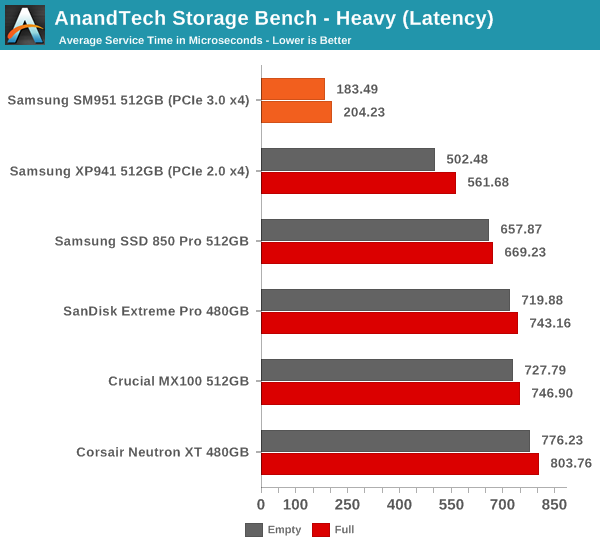 While The Destroyer focuses on sustained and worst-case performance by hammering the drive with nearly 1TB worth of writes, the Heavy trace provides a more typical enthusiast and power user workload. 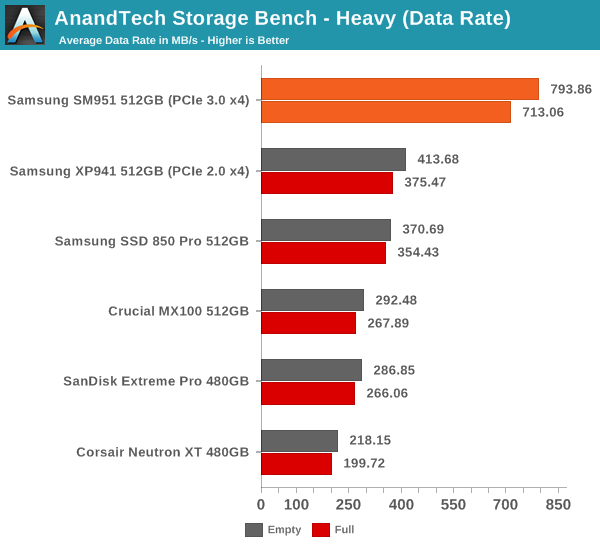 By writing less to the drive, the Heavy trace doesn't drive the SSD into steady-state and thus the trace gives us a good idea of peak performance combined with some basic garbage collection routines. The Heavy trace drops virtualization from the equation and goes a bit lighter on photo editing and gaming, making it more relevant to the majority of end-users. The Heavy trace is actually more write-centric than The Destroyer is. A part of that is explained by the lack of virtualization because operating systems tend to be read-intensive, be that a local or virtual system. The total number of IOs is less than 10% of The Destroyer's IOs, so the Heavy trace is much easier for the drive and doesn't even overwrite the drive once. The Heavy trace has more focus on 16KB and 32KB IO sizes, but more than half of the IOs are still either 4KB or 128KB. About 43% of the IOs are sequential with the rest being slightly more full random than pseudo-random. In terms of queue depths the Heavy trace is even more focused on very low queue depths with three fourths happening at queue depth of one or two. I'm reporting the same performance metrics as in The Destroyer benchmark, but I'm running the drive in both empty and full states. Some manufacturers tend to focus intensively on peak performance on an empty drive, but in reality the drive will always contain some data. Testing the drive in full state gives us valuable information whether the drive loses performance once it's filled with data. 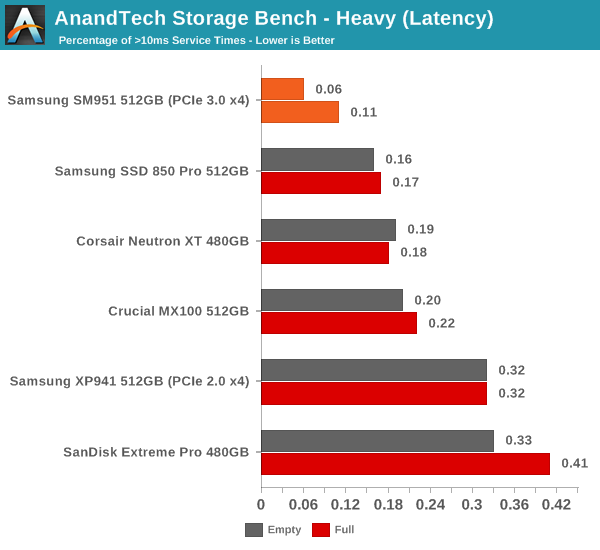 The SM951 performs even strongly in our Heavy trace and presents nearly 100% improvement in data rate over the XP941. In full state the SM951 loses a bit of its performance, but that's normal and the drop isn't any bigger than in other drives. Despite the lack of NVMe, it's starting to be clear that the SM951 is significantly faster than its predecessor and any SATA 6Gbps SSD. The average latency is also cut in less than half, which is actually a more substantial improvement than going from a SATA 6Gbps drive to the XP941. The share of high latency IOs is also the lowest with only 0.06% of the IOs having a higher than 10ms service time. I'm not sure that we will see anything too interesting client side from them. They seemed to have moved all their focus to the enterprise side, which is of course where the bulk of the money is. -- Intel has the best enterprise SSDs on the market.